More weird than good, The Anderson Tapes mixes under-cooked caper with poorly defined conspiracy and yet the result is oddly pleasing. 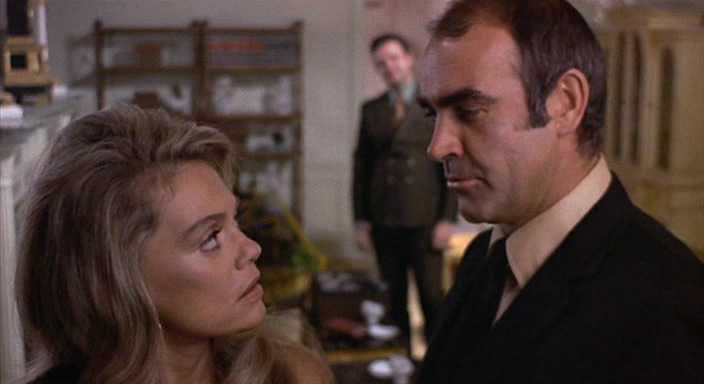 Safe cracker John "Duke" Anderson (Sean Connery) is released from prison and immediately makes his way to New York City and into the arms of Ingrid (Dyan Cannon), his former mistress. She now lives in a swanky apartment building, and the gears in Duke's head start to turn: all the units in the relatively quiet building look rich and relatively easy to break into. Oblivious to the watchful lenses of a multitude of surveillance cameras belonging to various government and private agencies scattered throughout the city, Anderson starts assembling a team. 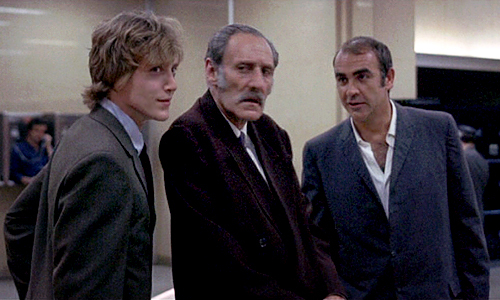 The Kid (Christopher Walken) is an electronics expert who was in prison with Duke; Tommy Haskins (Martin Balsam) is an antique dealer who can help identify and then sell the valuable items in each apartment; and Jimmy (Paul Benjamin) is the driver. Finally, the tottering "Pop" (Stan Gottlieb) will impersonate the doorman to keep watch in the lobby. The plan will be financed by mobster Pat Angelo (Alan King), but he insists on an unexpected twist that causes disarray: tough guy "Socks" Parelli (Val Avery) has to be part of the team. The Anderson Tapes was among the earliest films to introduce an undercurrent of unease due to all-pervasive surveillance running amok in modern society, and as Anderson and his crew plan the robbery, their every move is surreptitiously tracked by various unnamed government agencies using audio and film recordings. None of the g-men appear to be talking to each other and the Frank Pierson script works hard to make the point that all the technological snooping amounts to naught: none of the dots are connected, the robbery plan isn't disrupted, and the in-progress police response is triggered by a paraplegic boy using a ham radio connected through Hawaii. Capturing volumes of information and putting it to good use are two different things, a lesson that has only increased in value over the decades. While the surveillance angle would become ever more interesting in 1973 with the uncovering of the secret White House tapes as part of the Watergate scandal, in the context of the film, all the conspiratorial recordings start nowhere and lead to the same place. That may be the plan, but it leaves The Anderson Tapes with a rather shallow premise: ex-con plans new job, executes badly. 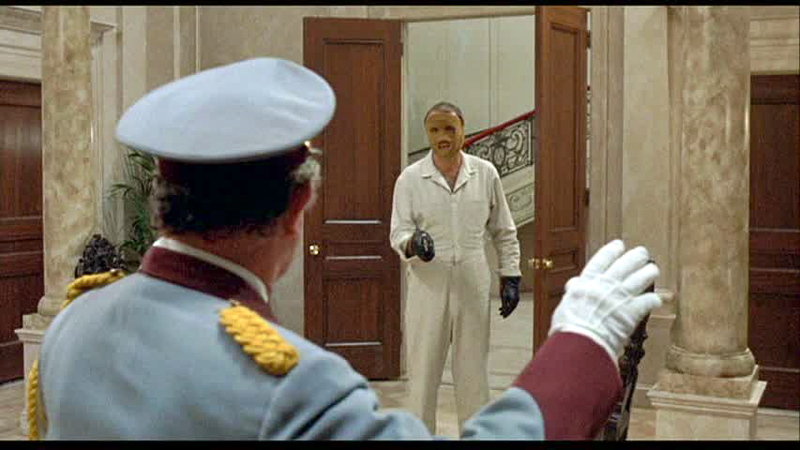 The central robbery as conceived by Duke Anderson is such a sure-fire disaster that some moments start to unintentionally descend to Pink Panther farcical territory. The robbery unfolds at a pace slow enough to make the tortoise look good, and the bungling burglars wear masks yet call each other by name in front of witnesses while shuttling up and down the building bundled into a slow moving elevator. With half of the New York police force assembled in the street waiting for Anderson and his crew to conclude their plodding work, the robbery becomes a predictably calamitous train-wreck unfolding in slow motion. With Quincy Jones providing a jazzy music score, Director Sidney Lumet makes good use of the acting talent at his disposal. Sean Connery puts in a good shift trying to distance himself from the Bond persona, and notably makes no attempt to hide the thinning hair. Anderson is a jailed criminal when the movie opens and works hard to confirm himself as a failed criminal throughout, his unsophisticated methods as far as imaginable from Bond's suave assuredness. In support, Dyan Cannon provides Anderson with a professionally opportunistic bed partner, Christopher Walken makes his studio film debut as the mop-haired electronics expert (and, in a further example of a bad plan going awry, somehow becomes a safe-cracker during the course of the robbery), and Martin Balsam plays the gay antique trader with a barely concealed smile. But the real over-the-top performances come from Val Avery as the always-about-to-boil-over henchman Socks and Ralph Meeker arriving late as puff-chested police Captain Delaney. By the time Meeker starts issuing bizarre orders to his men and Avery starts punching victims up and down the building in a perfect example of how to cause an unnecessary ruckus at the worst of times, The Anderson Tapes has made its point: criminals will find ways to eventually shoot themselves squarely in the foot, regardless of how many cameras and microphones are recording their every dense move.